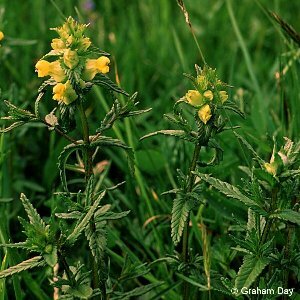 Once a very abundant species of hay meadows and very characteristic of the traditional meadow vegetation, but now much less abundant owing to the changes in farming practice which have seriously reduced the amount of hay meadows in Northern Ireland and elsewhere. 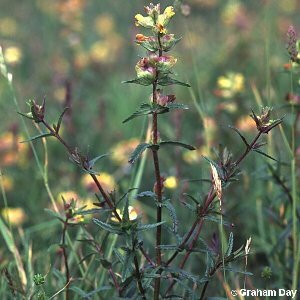 All names: Rhinanthus minor L.; Rhinanthus minor agg. L.; Rhinanthus drummond-hayi (F.B.White) Druce; Rhinanthus gardineri Druce; Rhinanthus calcareus Wilmott; Rhinanthus spadiceus Wilmott; Rhinanthus lintoni Wilmott; Rhinanthus lochabrensis Wilmott; Rhinanthus vachellae Wilmott; Rhinanthus crista-galli auct. ; Rhinanthus borealis auct. ; Rhinanthus groenlandicus auct. ; Rhinanthus monticola auct. ; Rhinanthus perrrieri auct. ; Rhinanthus rusticulus auct. ; Rhinanthus stenophyllus$ auct.